Medusa: KIMKINS & MCD: WHAT'S WITH ALL THESE SUBSERVIENT CHICKENS??? KIMKINS & MCD: WHAT'S WITH ALL THESE SUBSERVIENT CHICKENS??? On the Internet landscape has arrived a most bizarre website, magicchicken.net, and on Friday I did a blog post about its full-blown craziness...CHICKEN LADY FOWLED BY ONE CRAZY CHICKEN !!! But...is there a method to its seeming madness? Is it a clever offshoot of viral marketing? I'm sure a lot of you will remember Crispin Porter’s Subservient Chicken viral campaign for Burger King. It was one of the most famous examples of viral marketing in action on the Internet. "NEW YORK On April 8 of last year, something odd emerged on the Web: a chicken dressed in garters that could do seemingly any command viewers requested.After being seeded into several Internet chat rooms, the "Subservient Chicken" instantly struck a nerve with bloggers, in part because the site's technology allowed users to type in nearly anything and get a response from the chicken. He could do jumping jacks, dance, do push-ups and even watch television. He seemed impossible to stump. Within a day after being released, the site had a million hits. Within a week, it had received 20 million hits. Who was behind this strange Web phenomenon? Many visitors to the site were surprised to see it was Burger King." So, is this bizarre mcd.net website driving people to the actual magicchickenwebsite? I sincerely hope not. Many have speculated that one of the Lupers is the author of the magicchickendiet.net site. If that is, in fact, proven to be true, there's a whole lot of craziness going on in that family. If you take a look at Mariasol's post Magically Crazy Chicken , you'll see that the Magic Chicken Diet and the deadly Kimkins starvation diet are kissing cousins, borne of the same mind-boggling VLCD (very low calorie diet) craziness. Mariasol has broken down the daily rations on the Magic Chicken diet and posted a picture of what those rations look like. Warning: Not for the faint of heart or squeamish. And the always funny, Elle, has a great blog post on her blog, Grilled Cheese Sandwich With Pickles, about the Magic Chicken Diet: The Chicken Flies at Midnight! So, what do you think? Is mcd.net a brilliant marketing ploy to drive traffic to the MCD diet website, or is the mcd.net site simply the ravings of a lunatic? 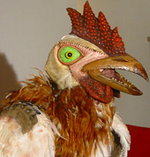 "Visitors to the website will find a person in a chicken suit, standing in the middle of what looks to be a somewhat ragged-looking living room. Beneath the chicken is a box to type in your request for the chicken, along with the slogan "Get chicken the way you want it. Type in your command here." Input a suggestion into the box, and then wait to see if the chicken (or person in a chicken suit) will cooperate. Start off by typing "riverdance" or "throw pillows" and then let your imagination run wild. There are a lot of things the chicken won't do (and that is probably a good thing), but SubservientChicken.com is a fun distraction. The garter-clad subservient chicken can be prompted to do one's bidding in response to a variety of keywords. The chicken has a repetoire of about 300 different actions..."
"PS Andiamo Systems has paid that magic diet site a visit plus another outfit with ip address of 209.85.173.104 near or in San Mateo, Ca. and hopefully they can help us with our cause." "Pssst...people are talking about you. Your business. Your products. Your competitors. Your customers. On the millions of blogs, forums, social networks, review sites & message boards. On mainstream media and PR newswires. Listen, understand and you'll prosper." I agree with you, Bama, that it is a poor marketing ploy...and a very poor marketing ploy at that. Clever, it is not. In poor taste, it is. I appreciate you taking the time to comment, Bama. Thanks for that. Disturbed. That's the first word that leaps to mind when viewing either the Magic Chicken Diet dot net OR the Subservient Chicken thingy. Disturbed. Disturbing. What hath the internet wrought? So what is she talking about, Google paid a visit ? huh? Somebody googled the site? wow that's never happened before. yeah. And wth is the deal about the Andiamo agency? We're eagerly awaiting the unfolding saga of Bonnie & her multitudinous careers -- as she bids the world of online starvation peddling a fond CYA & tootles off to the big city to enter the world of offline insurance peddling, what will become of Chicken Lady? What will become of Chicken Lady's hubby? What will become of the mysteriously elusive "members" of the Chicken Lady's dot com support board? Did they ever actually exist, or were they merely inventions of a marketing experiment gone horribly wrong? We want answers to these and other mysteries of life -- who, oh who, O Great Medusean Blogger! -- who will reveal the answers? Who will expose the truth? And who, whooooo, will pay for all this pizza? That subservient chicken website is a hoot. My coworkers and I played wayyy too much with it once when we were all waiting around to get downsized. Depressing times call for impressive diversions!